The launch of a Hot Wheels toy aboard Elon Musk's Telsa Roadster to space has sparked sales of the Mattel replica. The launch of Elon Musk's Tesla Roadster on SpaceX's first Falcon Heavy rocket has fostered fresh demand for the same car now traveling through space. No, not the electric hot rod, but rather its smaller replica: a Mattel Hot Wheels toy that was mounted on the Roadster's dashboard. The red Hot Wheels Tesla Roadster sold for $1.09 when it hit toy stores in 2016 and was selling between $5 and $15 on eBay as recently last month. Now, less than week after the launch, it is commanding as much as $100, with newer listings asking $150 or more. Musk mounted the Hot Wheels model on his space-bound Tesla after a friend suggested the idea. The "little car in the car," as Musk phrased it, lifted off on Tuesday (Feb. 6) and is now on its way to a point in space just beyond the orbit of Mars. This July, it will begin to loop back on an elliptical orbit that is expected to repeat for millennia to come. "It is silly and fun, but silly and fun things are important," said Musk, who is the chief executive at both SpaceX and Tesla. "I think the imagery of it is something that is going to get people excited around the world." Photos taken prior to flight and SpaceX's live video feed of the Roaster leaving Earth only capture the Hot Wheels car from afar, leaving some question as to what version of the toy is now in space. Mattel first sold a Hot Wheels Tesla Roadster in 2008, the same year Tesla put the car on the market. That first year, the toy was only offered in blue, green and silver. In 2016, the Roadster was re-issued in red. In fact, there were two red Roadsters offered: a "mainline" model, which Mattel mass produced, and a "Super Secret Treasure Hunt" variant (referred to by collectors as just a "Super") of a much more limited run. Mattel introduced its Treasure Hunt series of cars in 1995 and at first marked its packaging to identify which they were. Starting in 2013, the company did away with the labels, instead favoring a subtler approach, which made the Supers harder to find. The 2016 mainline Roadster was a much brighter red than Musk's "midnight cherry" space car. The Super variant was finished in a "Spectraflame" metallic dark red, which more closely matches both the full-size Roadster and what looks to be the Hot Wheels toy now in space. Nevertheless, the market for both the mainline and Super versions has seen a boost since the launch. "There are TONS of new listings," read a post on Reddit. "Some are pushing $50. For the MAINLINE." Mattel offered three red Hot Wheels Tesla Roadsters, including a "mainline" 2008 model, at right, and a 2016 Super Secret Treasure Hunt model with a metallic finish that was closer in color to the car that was launched into space in 2018. The major thing missing from both the mainline and Super models that the Hot Wheels toy in space has is a Starman. Musk had the replica Roadster modified to include its own scale model of "Starman," the spacesuited mannequin that is "driving" the real Roadster, named in memory of the late musician David Bowie. "There's a tiny Roadster with a tiny spaceman," said Musk. 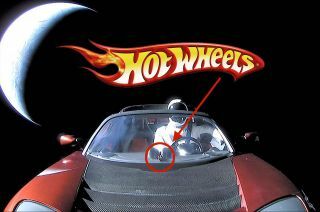 The popularity of the Falcon Heavy's launch has led some Hot Wheels and SpaceX fans to hope Mattel will produce a Starman special edition of the Hot Wheels Tesla Roadster in the (near) future. "Okay Hot Wheels, no pressure, but if you're not making a tiny, midnight cherry Tesla Roadster with Starman in the driver's seat, you might be doing something wrong," wroteone fan on Twitter. Similar comments were also posted on Mattel's official Hot Wheels collectors forum. If Mattel does offer a new SpaceX-inspired Roadster, it will add to the company's history of producing Hot Wheels toys for space missions in the news. In the 1990s, the company produced several Hot Wheels "Action Packs" that featured miniature versions of NASA's Mars rovers, planetary probes and one that celebrated the spaceflights of astronaut John Glenn. More recently, Mattel offered a Hot Wheels toy version of NASA's Mars Curiosity rover, which hit store shelves within a month of the mission landing on the Red Planet in August 2012.